AC Lichtenstein, the producers of the show plan to sue Tommy for not fulfilling his contract for 36 performances. Chong is considering a countersuit for unpaid wages and damages. During the interview, Tommy revealed he is working on a book about his Operation Pipedream arrest, as well as a book on Cheech and Chong. He also mentions that "Holy Smoke" is the current working title for the Cheech and Chong reunion film. The Kansas City Star also had a chance to interview Tommy. He's in town for this weekend's shows at Stanford and Sons Comedy Club. 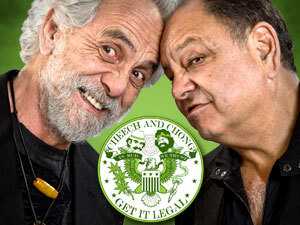 Word on the street is that Universal is looking to re-release Cheech and Chong's Get Out Of My Room on DVD and CD. Get Out Of My Room is generally considered Cheech and Chong's last project together. However, in interviews Tommy said it eventually became Cheech's project and that he (Tommy) had a small role in it's development. This re-release plan is still in it's infancy. We'll let you know when we learn more. Tommy and Shelby Chong will be performing at Stanford and Sons Comedy Club next weekend. Where: Stanford and Sons Comedy Club, Overland Park, KS. Vivendi Universal Games has closed a deal with Al Pacino to lend his voice to a video game based on the movie Scarface. Cheech Marin, Jay Mohr and other celebrities will be doing voiceovers for other characters. Cheech To Sing on Camp Freddy Record? According to MTV News, ex-Jane's Addiction guitarist, Dave Navarro, is looking to have Cheech Marin lend guest vocals on the new Camp Freddy album. Camp Freddy which consists of Velvet Revolver's Matt Sorum on drums, Dave Navarro on guitar, The Cult's Billy Morrison on guitar, bassist Chris Chaney and singer Donovan Leitch, are putting the finishing touches on the new album. The guys of Urban Damage created this immaculate Cheech and Chong mural. Shortly, we will be posting more information about these masked men, as well as where to locate the mural. Brett Alexander of the "Cheeb and Bong Puppet Theater" (we've promoted his great comedy CDs on this site in the past) is creating a prototype of the Tommy Chong signature guitar. It's almost finished and may be available for purchase later this year. We will provide more information as it becomes available. Cheech Marin attended this year's Nickelodeon's Kids' Choice Awards with his daughter.